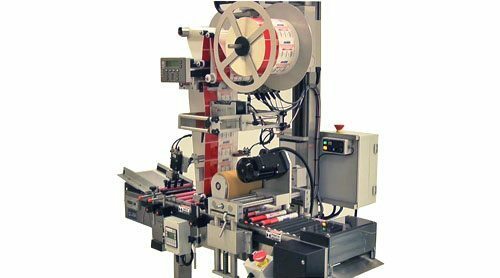 This Horizontal Roller system applies labels to small diameter products. The system shown is designed for a 5/8” in diameter with an oversized cap. Features include top-mounted label applicator, top-mounted wrap station and a 48″ conveyor with stainless steel frame. Options include Allen-Bradley controls, automatic product loading and product accumulation. Products are manually loaded onto the horizontal roller conveyor, aligned by the guide rails as the label is applied. The top-mounted wrap wheel rotates and impresses the label around the product.